He who seeks, wants to find. And fast, if possible. Hence the main reason care provider Volckaert implemented a new solution for document management. They didn't need to look far. ,,We already worked with OpenIMS", Thirza Olden, secretary of the board, explains. ,,OpenIMS had so many more functionalities than we were aware of. And is so easy work with that one instruction session sufficed." 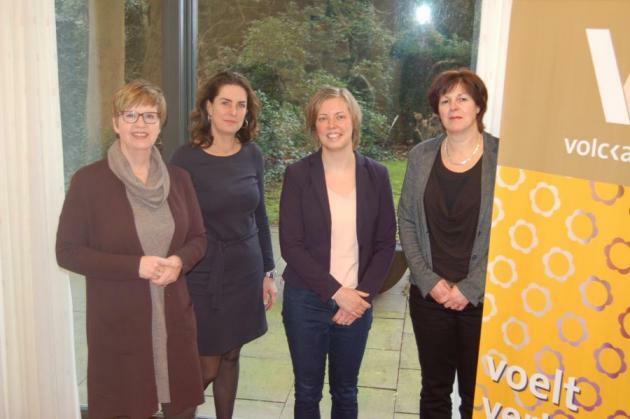 Annette Lemens - advisor communication, Thirza Olden - secretary of the board, Evie Cleven - advisor policy and innovation, Jolanda de Man, secretary and project manager (from left to right). Meanwhile complaints about untraceable documents have gone silent and there's hardly ever a phone call with request for help. ,,We can now use documents the way we want. Our intranet is now top of mind, the underlying Document Management System is way more efficient and we all save a lot of time." Olden together with three co-workers runs the executive office of the biggest organisation for senior care services in Oosterhout and Dongen. The four of them realised more than a new DMS. Olden: ,,OpenIMS also proved to be suitable for the registration of mail and when you renew your DMS you need to check on your intranet anyway. We cleaned up rigorously, checked the naming of documents and redesigned the structure of both CMS and DMS completely." Jolanda de Man used to manage all her work as secretary of the board of directors in Microsoft Excel-sheets. She joined the DMS-project to include the mailregistration, was appointed project manager and now takes up the functional management of the DMS, with clear ambitions for the further development. ,,Other mailregistration systems were more expensive and required more complex connections to our other systems. When we discussed our ambitions with OpenSesame ICT, it became obvious we already had the solution in house. OpenIMS DMS can do it all and we could get all project support we needed. Important, for we had had a lot to learn." Evie Cleven and Annette Lemmens advise on respectively policy and innovation and communication. Cleven focused on rolling out the new house style, the search function and the acceptance of the new intranet: ,,OpenIMS met almost all our wishes. There are systems on the market that offer more interactivity, but with those connecting to our documents would become an issue. Improving the search function was more important to us. And surely a social intranet would be nice but we abandonned that wish for now, because the possibilities of OpenSesame ICT and OpenIMS are convincing and have proven themselves. Other parties tried to convince us that 'anything is possible', but we kept seeing question marks above their heads. Besides: why would we invest in yet another package?" ﻿The most challenging problem was that the employees at Volckaert couldn't find documents. 'It's just not there', Cleve so often heard co-workers sigh. Cleven: ,,The reason being that way too many results were found. There was no possibility to filter the outcome, for instance on document types like 'word', 'pdf', or 'excel'. Or show only results from news reports." ,,And another explanation we found", Olden adds, ,,was the classification that lacked logic. It did not reflect the practice on the workfloor. Take, for example, the protocol 'hand hygiene'. Untraceable. So people start looking elsewhere with Google and add new documents to the system. Consequently the number of duplications grows as does the variation in titles. The original document people had been searching for, we later discovered, was called 'washing your hands'." A rigorous clean-up was not a luxury. Over 700 documents were reduced to less than 400. Cleven: ,,People now also are more aware of their responsibility for the document management of Volckaert. If they type their name, they instantly get to see all documents of their own. And if a document has an expiration date and has to be deleted, they receive a notification." Olden: ,,On top of that we can assign documents to roles in the organisation. Those roles, instead of the documents itself, are granted to the people in the organisation. And are easily revoked when people leave or change position. An indispensable feature!" Everyday work for Jolanda de Man has changed completely due to the mail registration module in the DMS. She was used to always having impatient co-workers at her desk, now those co-workers find their mail by themselves, at their own desk. ,,Whatever keyword they use, the right mail item will pop up." She's no longer typing numbers of items that were scanned and converted to pdf in Excel-sheets, but functionally manages the DMS. A world of possibilities has opened up. ,,There's still a lot off archive records I want to digitalise and with the creation of new files I want to use version control. The amount of paper we use, will decrease substantially, also during board meetings. The future will be all tablets." The improved document management is certainly driven by the redesigned intranet. Cleven, smiling: ,,If you approach quality manuals and mail items through a visually attractive interface, you don't want to first visit an old-fashioned homepage. Thus, this was the moment to also reshape our intranet into the new house style." As a result, the inranet is now top of mind, the four proudly notice. De local network drive 'L' is hardly used anymore in favor of the intranet. ,,People no longer need to search through the drive or join meetings to gather the information they need. 'It looks good', we keep hearing." The intranet meets all wishes users have. Olden: ,,We actively collected those questions. For example, the pharmaceutical compass. Almost everyone had this stored on his desktop. Now everyone finds it on the intranet." Cleven: ,,Teammanagers asked to put the Electronic Health Record (EHR) in a prominent place. We honored that request by adding a link to the portal. Easily." 'Easily', a word project manager De Man and her team, now functional managers of the DMS, would not have used a few months ago. The way they developed the necessary knowledge and skillset tot manage the DMS proved to be a very valuable result of working with OpenSesame ICT. ,,We did it all together. Restructuring the menus in both CMS and DMS as well as organizing and administering the DMS. The people from OpenSesame ICT patiently supported us every step of the way. They understood very well what we did and did not understand." Olden: ,,They were very amenable. It's a completely different way of thinking. They were always very responsive and quick. Very pleasant and it also gave us the confidence to say 'let's go do this'. Cleven: ,,Yes, when the main structure was built and the first pages were designed, we simply started building." From five modern and accommodating locations in the heart of Brabant over 1000 professionals and 500 volunteers together provide sevices in Housing, Care and Welfare. Vlckaert-SBO is an innovative, cooperative, involved and enterprising organisation. Volckaert strives for the right balance between doing well, according to modern standards, and being well. Meaning: work showing empathy and respecting fellow human beings. OpenSesame ICT is a Dutch software company that focuses on the creation of knowledge intensive business solutions based on Open Source technology. These solutions are known as OpenIMS and Sugar. With several projects on Content, Document, Knowledge, CRM and Workflow Management OpenSesame ICT has proven to deliver outstanding solutions for knowledge and information management. For more information please contact Mr. H.W.W. Kunst(Business Development Manager) bdm@osict.com or visit the websites www.osict.com and/or www.openims.com.